We are proud to announce that we purchased The Aquaponic Source on Oct 9th 2015. We have some really big shoes to fill, as Sylvia and Alan Bernstein begin a new chapter in their lives. It has been a remarkable achievement on their part to not just build a successful company from scratch but to help create and shape a whole new industry. We are honored to be continuing the aquaponics community and online store as a cornerstone for aquaponic enthusiasts all over the world. We have watched this community grow from a few fledgling followers (being some of the first members to sign up) to thousands of people making a difference in home, school and community food production. 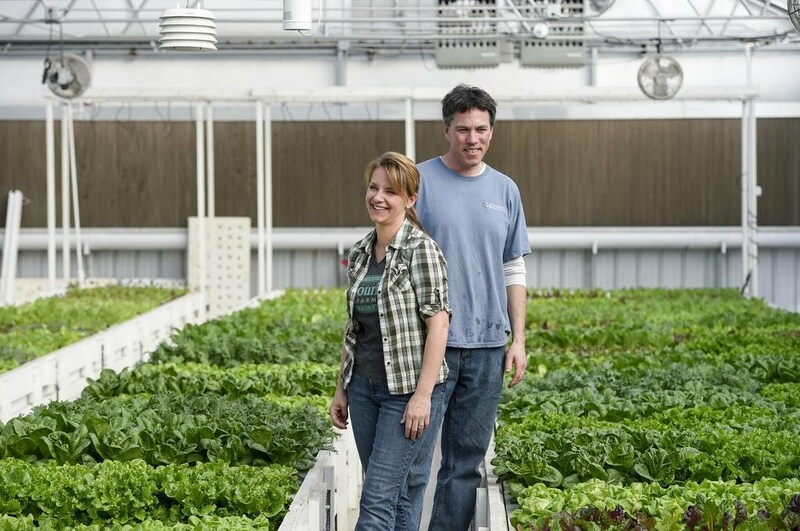 We started our business, Colorado Aquaponics, literally the same day as Sylvia began The Aquaponic Source in 2009. Our paths have crossed many times over the years being in the same state with the same passion to grow food, grow community and grow an industry. We have always chosen to be collaborators instead of competitors, figuring that we can get a lot more accomplished when each person (and business) gets to focus on their strengths. So while The Aquaponic Source was building their online community of people sharing stories, images and helping each other grow, JD and I have spent the last six years working with the GrowHaus community, a Northeast Denver food desert neighborhood. Here we have built and maintained a dozen demonstration aquaponic systems, and in the fall of 2012 we moved Flourish Farm our 3,000 sq ft aquaponic farm from Arvada to the GrowHaus. Since then we have raised thousands of tilapia, hybrid striped bass, catfish, koi and bluegill. We have grown over 100,000 vegetables, trialing hundreds of different varieties, and selling over 30,000 pounds of food within a 5 mile radius of our farm. Most importantly, we have continued to donate 10% of our crop to the GrowHaus for distribution to our local community. Our six year old twins and nine year old daughter have spent many days “helping” at the GrowHaus, and think of it as a second home (although they still think a farm should have a red barn and horses or cows). 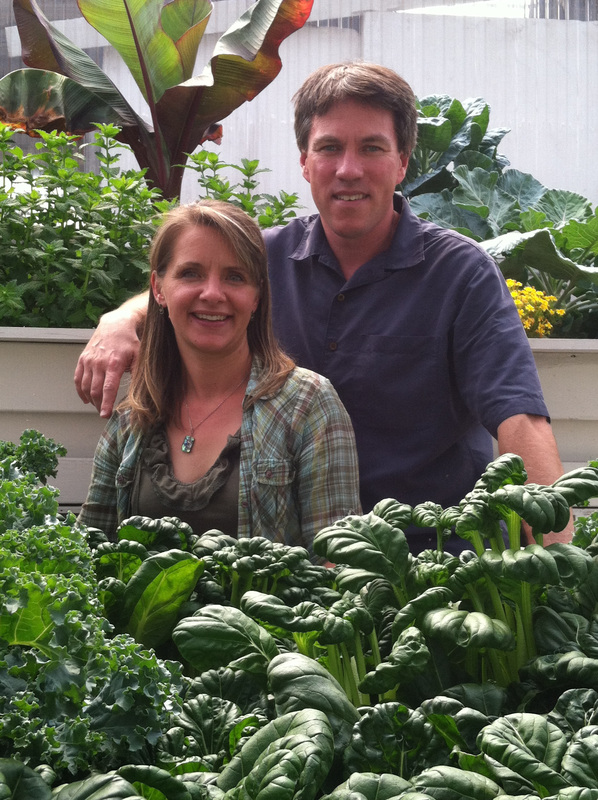 Our mission, just like Sylvia and Alan’s, is to empower people to succeed at growing their own food. We will continue to pursue this goal everyday through farming, research and development and education. In purchasing The Aquaponic Source, we now have a wide range of products and services for home, hobby, school, and community aquaponics projects. We are driven to prove that aquaponics can be environmentally, socially and financially sustainable. Thank you for your continued support and we look forward to helping you achieve your aquaponic goals. Aquaponics is the raising of fish and plants in recirculating systems whereby the fish provide nutrients to the plants and the beneficial bacteria and plants help to return the water clean to the fish. It’s a highly productive eco-system with many extraordinary benefits, most notably its ability to conserve water with minimal if any discharge. While there is plenty of information out there about the benefits of aquaponics, let’s talk about some specifics regarding system design that could be particularly important for mitigating some of the risks and challenges often found with aquaponics. To provide some context and scale, I’m using my aquaponics facility, Flourish Farms which occupies a 3,200 sq ft greenhouse. However, these ideas are applicable to any scale system. Our aquaponics farm is designed with the flexibility to run in a “de-coupled” mode whereby the fish system can be operated independently of the hydroponic plant system. In normal operation, the water from the fish tanks flows through a series of filtration tanks and then out into the hydroponic system. A single pump returns this filtered clean water back to the fish system. In de-coupled mode, water from the fish tanks flows through the filtration system as it does in normal operation but it does not pass into the hydroponic troughs, it returns via a separate line back to the fish tanks. The filtration or life support system (LSS) is designed to provide the proper mechanical and biological filtration necessary to support appropriate water quality for the fish. When the fish system is running on its own loop, the hydroponic system can also continue flowing via its own pump. In our farm, water pumps from the last deep water culture trough back to the first trough maintaining continuous flow through all four troughs. This can also be run through a second sump. · Power failures and a lack of good backup, monitoring and alerting systems. · Loss of water due to a blockage, overflow, rupture or operator error. · Poor temperature control and water quality management. Variability in temperature can be highly stressful on fish and if you are not able to properly control temperature, fish may stop eating. If your fish stop eating this affects the nutrient dynamics in your system. · Fish disease can also creep up quickly if the temperature, water quality and health of the fish are not being regularly monitored or you are not quarantining fish upon arrival from other sources. Other reasons for having a decoupled system can include the fact that you can cycle your fish system independently while having plants growing in your hydroponic system. Or perhaps you started as a hydroponic grower and you are adding on an aquaculture component later in the cycle. Another popular design is to have your fish system in a separate facility or “head house” and your plants in a greenhouse. The systems can still be hydraulically connected so that fish water can be delivered to the plant system but may not necessarily return to the fish house. Another advantage is that the hydroponic troughs (DWC) can be run at their own flow rate if so desired. In other words, when the fish and plant system is running together in normal operating mode using a single pump, the hydroponic pump could be used to circulate water at a variable flow rate through the DWC troughs as well. This requires the running of two pumps, but if increasing flow rate in the hydroponic troughs is desirable than the separate DWC pump and plumbing gives the operator the ability to do so. This could be beneficial in case water flow rates are too low through the troughs. Water quality parameters can also be managed independently and optimized for each system. For example, fish tend to like a higher pH and plants like a lower pH. Temperature could also be managed independently depending on the location, environmental controls, fish species etc. As is often the case in commercial aquaponics, the majority of the revenue is in the plants so having your plant system entirely dependent on your fish system creates a single point of failure scenario which can be avoidable in a decoupled system. If you have an issue with your fish system for any of the reasons cited above or more, you can still continue to run your hydroponic system on an organic nutrient solution so that you are able to maintain your production crop, your customers and your revenue stream. When reconnecting the two systems, it will be important to ensure ammonia and nitrites have been fully oxidized and are at safe levels for the fish. Water temperature, pH, Alkalinity and other factors affecting water quality may not be properly aligned between the fish and plant system so adjustments to these levels may be necessary to make a seamless transition and minimize stress on your fish. There may also be other elements of the hydroponic nutrient solution that could be problematic for fish at certain levels. For example we raise hybrid striped bass which are sensitive to potassium. It is always important to do your homework when you are considering adding something to your aquaponics environment. Thinning out the solution and exchanging with fresh water may be required to help reduce any potential toxicity and allow you to safely reconnect both environments. Dreaming of Home Scale Aquaponics? You've discovered aquaponics, you're psyched about the possibilities, you want to take your knowledge and understanding to the next level...but where to start? It's easy to get overwhelmed with all of the components and science jargon when starting up your own home system. As a designer by trade, the part that I love most about building a home aquaponics system is the flexibility and customization options it affords; Go for an easy assembly kit or get down and dirty with the materials that you have around you! And that's exactly what Robert Eschbach of Denver did! We had been corresponding with Robert for several months over the summer with some water cycling questions before adding some of our Tilapia to his home system. He picked up 4 Blue Niles and 2 Rocky Mountain Whites in August. About a month later these photos arrived from Robert who thought they might be just the inspiration others need to get started. CA: So Robert, how did you first learn about Aquaponics? RE: One of my friends posted an article on Facebook several months ago. I've always been interested in sustainability and was fascinated with the concept. From there I started researching on my own, primarily through online forums on aquaponics. CA: Describe your system for us. RE: I have a 55 gallon fish tank set beneath my grow bed. There are two holes in the bottom of the growbed, one where the water is pumped in to the bed and the other for the bell siphon. About 1/3 of the fish tank water is pumped up to the growbed which fills about every 10 minutes. There's one fluorescent light on a pulley system over the growbed to provide supplementary light to the plants. CA: How many fish do you have in there? RE: Right now there are 5 fish total, one Rocky Mountain White juvenile and four Blue Nile fingerlings. CA: What types of things are you growing? RE: Lettuce, Mesclun greens, Peas, Basil, Wheat Grass. Everything is about two months old. I started them by simply broadcasting seeds straight into the media bed. CA: How much money do you think you have put into building and maintaining your system? CA: What was your biggest obstacle/most frustrating moment? RE: The Bell Siphon! Getting just the right amount of flow into the bed in order to start the siphon took a lot of trial and error. The water pump tube clogs up and slows the rate of flow. I recommend not gluing in any of the plumbing pipes so that you can easily make adjustments as needed. Don't get too anxious to get it started and know that it may take a lot of tweaking to get your system flowing just right. CA: What was your best resource for aquaponic knowledge? RE: I did all my research with free blogs and forums found on the internet. I can't remember the exact names of them, but there is a ton of free resources on the web. CA: Any last thoughts you want to impart to those who are dreaming of having their own home aquaponics systems? RE: It's important for people to be proactive about living more sustainably. Everyone needs realize that aquaponics is just a part of a bigger means toward eating healthier food and knowing where your food comes from. Big Thanks to Robert for sharing his experience, the system is looking great! Don't forget that the Colorado Aquaponics team is a great resource for Aquaponics questions that you may be stuck on. We continuously offer one-day workshops each month that cover everything from fundamental concepts to pump sizing, plumbing, and construction! Check out the Education tab of our website for upcoming class schedules and registration! See you there! Pine Ridge, SD July 26, 2013 – The American Open Currency Standard (AOCS) joins Colorado Aquaponics (CA) for the “Basics and Build Aquaponics Workshop” on August 10, 2013. The workshop is part of an ongoing project to build a full-service aquaponic facility at the site of the new Lakota Dollar Store, to be managed by residents of Pine Ridge. Aquaponicly grown organic food, together with the new Oglala Lakota Sioux tribal community currency, offers better choices than what central planning affords most Americans. Monetarily, Americans are coerced to use central banking currency that constantly loses value due to inflation. This lowers the standard of living over time and erodes wealth that could be used for savings. AOCS encourages Americans to empower communities with local currency. They also help supply the minted coins to Indian Nations such as the Oglala Lakota. The centrally planned food industry yields similar results in terms of the quality. While no one firm has a monopoly on food distribution, the regulatory structure favors large corporations, as the cost of compliance inhibits entry into the market. It also dictates the way food is grown and processed, steering the market towards an unhealthy diet. The system also creates hostility toward natural alternatives such as raw milk. Results - central planning & factory farming has been as bad for health and nutrition as central banking has been for the monetary system & economy. Today, First Nations people suffer from higher rates of obesity, diabetes and chronic disease than any generation in history. Organic alternatives can be expensive and difficult to access. Our message: Grow Your Own. CA and AOCS are helping develop a facility in Pine Ridge to teach sustainable farming techniques within the Oglala Lakota Nation. This important outreach will empower Americans and Lakota Indians to enjoy optimum healthy organic foods through Aquaponic farming, as well as serve as a model for other tribes. Self-reliance and independence are American ideals shared by both organizations within their respective disciplines. That makes AOCS and CA natural partners for a more free America.